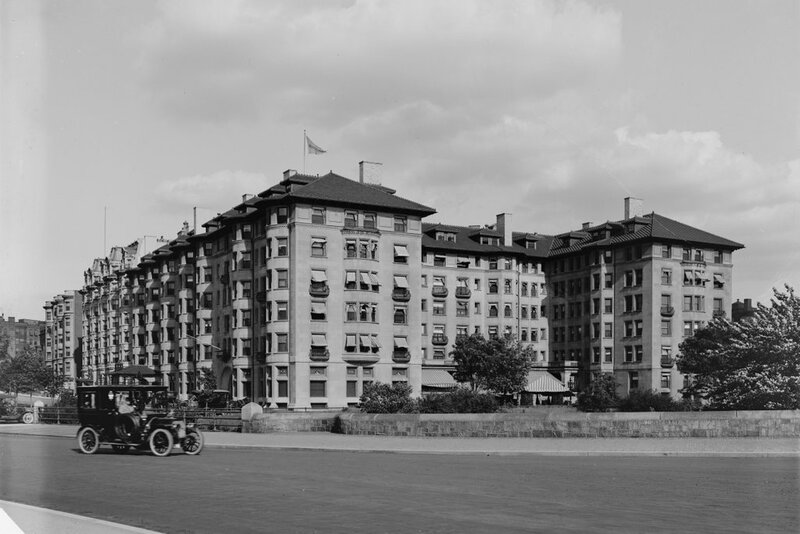 The Hotel Somerset at the corner of Commonwealth Avenue and Charlesgate East in Boston, around 1910-1920. Image courtesy of the Library of Congress, Detroit Publishing Company Collection. When this historic building was completed in 1897, it was at the very edge of the city. There were parts of Boston further west of here, such as today’s Fenway/Kenmore neighborhood, but at that point there was very little development going on. Even the 1898 city atlas didn’t cover further west of here, and it shows that many of the building lots around the hotel were still vacant. Although the Hotel Somerset was initially surrounded by vacant lots, the city soon grew up around it, as the first photo shows. 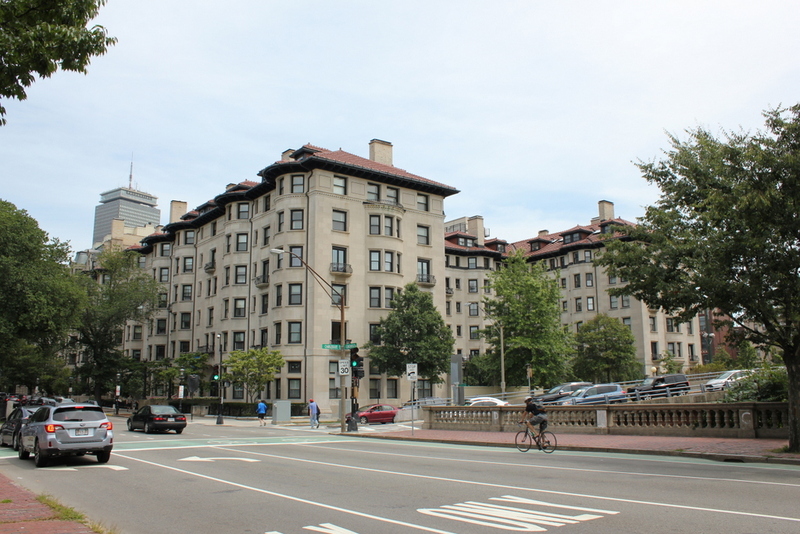 It was a prominent city hotel, with notable guests such as The Beatles, who stayed here during their visit to Boston in 1966, as well as visiting baseball teams, since Fenway Park is just a quarter mile away. Ted Williams also stayed here during the baseball season, renting Room 231 for many years. In the century since the first photo was taken, many of the surroundings have changed. The Massachusetts Turnpike passes within 50 feet of the building on the other side, and on this side an elevated roadway crosses Commonwealth Avenue, with an off-ramp on the right side of the photo in front of the building. The hotel itself was converted to condominiums in the 1980s, but from the outside it still doesn’t look much different from the first photo. It should also be remembered for the role it played during WW2 as barracks for Navy trainees who attended Wentwoth Institute — the USS Somerset. The best two months of my Navy life. Oh, were we spoiled — chow cooked by civilian chefs; Friday night dances; lovely ladies from Katherine Gibbs and liberty in the greatest Navy town in the world. Three years ago my grandson graduated from Boston College and I revisited my old “barracks”. It brought back so many memories. Thanks for sharing! And thank you for your service in the war. Gabe, My friend Ed Bell’s ( now deceased ) dad and 2 men owned the Somerset during WWll. Ed enlisted in USMC and served as a tailgunner/crew chief on a B25 in the S. Pacific. After the war the dad bought out his partners and renamed the hotel The Somerset. He also owned the Knickerbocker Hotel,NYC. He had 300 coins commissioned with the Somerset on one side and the minuteman on the other. Each coin was given to a dignitary and allowed one free night /board in the hotel. Prior to his passing Ed gave me his coin. Not sure how many of these are left, probably none. The Somerset has never heard of these and wanted to buy it from me. Ed gave me the coin as I am from Cambridge. Now have his war medals. I was an autograph collector from Revere in 1957. Base of operations was corner by Kenmore Hotel. Another kid from Brookline tells me he’s got Ted’s room number at the Somerset. So we go over, knock: “How the hell you know this room number?”. He told us to wait outside by the parking garage. We did and he signed when he came out. He had a white Cadillac. My Parent’s wedding reception was held at the Hotel Somerset August 30, 1947. The pictures from the reception show what a beautiful & elegant hotel it was. I remember sitting in the lobby of the Somerset Hotel in 1953 and watched Bobby Avila, the Cleveland Indians’ 2nd baseman, cross the lobby on his way to his room prior to a night game at Fenway Park. 8 years later I was sipping Mai Tai’s in the Polynesian Village downstairs from the lobby level. What a great place! I recall seeing a play ‘jaquec barrel is live and well and living in paris’ In the mirror ballroom at the hotel. I recall the ballroom looked like something out of Versailles. The ballroom was used for wedding receptions too.